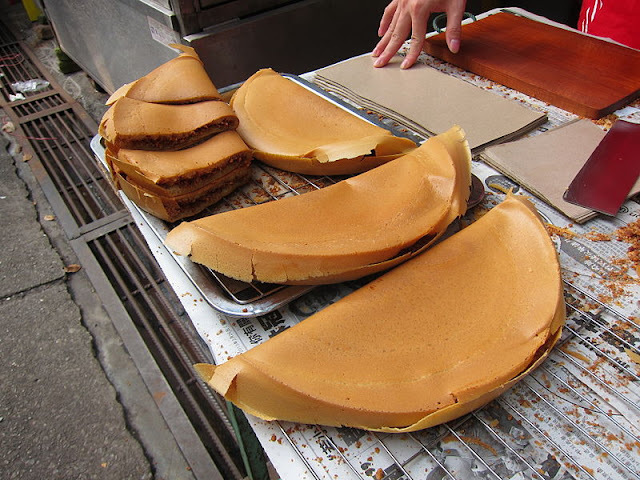 Apam balik (English: 'turnover pancake') or terang bulan (English: 'bright moon') or martabak manis (English: 'sweet martabak') common in Southeast Asia. It is usually sold at specialist roadside stalls throughout Brunei, Indonesia, Malaysia and Singapore. The pancake's batter is made from a mixture of flour, eggs, sugar, baking soda, coconut milk and water. The batter is cooked upon a thick round iron frying pan in plenty of palm margarine to avoid it sticking to the pan. Then other ingredients are sprinkled as filling; the most common or traditional is crushed peanut granules with sugar and sweetcorn kernels (available from cans), but modern innovations such as chocolate sprinkles and cheddar cheese are also available. Then, the pancake is folded (hence the name: "turnover pancake") and cut into several pieces.